Certainly this was a wine born under considerable controversy, receiving accolades and kudos from me and several of my American colleagues, but generally excoriated by the British press. The French wine critics were very positive. This wine has calmed down considerably as it was a blockbuster, somewhat of a Bordeaux fruit bomb in its youth, and now has toned itself down to a serious candidate for one of the wines of this rather bizarre, but interesting, vintage. 2003 offered everything, from pathetically dilute and thin wines to some massive blockbusters. 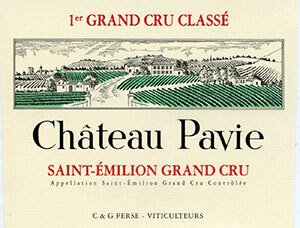 That was true especially in the Northern Médoc and from the limestone hillsides of St.-Emilion (where Pavie is situated). The color is a dark garnet, with a touch of amber beginning to appear on the edge. The wine has a stunning nose of roasted herbs, grilled meats, charcoal, blackberry and blackcurrant fruit, with some oak still present. Dense, full-bodied and very succulent and lush, this wine seems to be in late adolescence, ready to enter a relatively mature stage. There is always a suspicion because of the extreme heat in July and August that these wines will crack up very quickly, and certainly that will always be a worry, but this one looks set for at least another 10-15 years of drinkability.Drink: 2015 - 2030. Tasted at Bordeaux Index’s “10-Year On” tasting in London. I must confess that this nose is disappointing. Compared against Clos Fourtet, it comes across as a little ersatz with superficial raisin, stewed fig and kirsch aromas, leaning towards the New World. The palate is medium-bodied and displays good volume, filling the mouth with ease and there is clearly more depth than its peers. However, there is an ineluctable monotony about this wine that is bereft of the delineation and tension, the complexity and personality that makes say, the 2000 Pavie so entrancing. It is not a bad Saint Emilion by a long straw, but to put it bluntly...it’s a bit boring. Tasted March 2013.